Dynamic Product Ads (DPA) is an ad format that’s proven to be effective to boost sales because it can showcase products that instantly catches visitors’ attention. Its power has been widely recognized. However, optimizing DPA is totally another matter. It not only requires tons of knowledge on how digital ads works but also needs tremendous preparation for quality creatives and the automation of feed production, which are not typical e-commerce lacking an in-house IT team can afford and take care of. This technology-intense ad format, therefore, deters the majority away because of all the complexity, especially the creative part. Supported by most of the marketers interviewed, the performance of ad campaigns has a lot to do with creatives. While knowing the fact, most marketers find the lack of time is the core problems to make better banners and optimize ad campaigns. They, thereby, turn to the help of some software. However, according to our comprehensive survey, most software developed only focus on solving specific problems, which doesn’t create a real solution, rather than the overall issue. Given that the pain has become the hindrance for advertisers to make use of DPA to the fullest and there are not any one-stop solution provided for e-commerce in the market, the existence of AdChief, Tagtoo’s latest solution for e-commerce, is exactly to solve this urgent issue for e-commerce. In addition to that, while Tagtoo has helped hundreds of vertically integrated e-commerce customize and manage DPA, most small and medium e-commerce haven’t embraced the power of DPA or haven’t figured out how to harness the amazing power. We, therefore, think there’s a need to create a platform to duplicate more successful stories and share more resources with the public. AdChief enables advertisers, especially digital ad beginners, to build DPA more swiftly and create more possibility, which are what we’ve been always doing since the company was founded. As a whole, you would get the following features to make your ads management more effective with the use of AdChief. Feed production has already been a headache in the eyes of most business. But we are here to help! Ahead of other solution providers, we are among the first providing the hassle-free approach for feed production. What It takes is only a step, embedding a snippet of tracking code to your website, and we’ll take care of the rest. Automatically completing and updating product feed helps avoid unnecessary time on the troubleshooting, which requires a certain level of programming background, and, more importantly, allows business to stay more focused on strategy execution. Editing the creatives after they are uploaded is not an easy job. It‘s required to repeat the “collecting and uploading” process again to make any changes to the product feed. However, we have made it easier and significantly simplified the process with the use of technology. 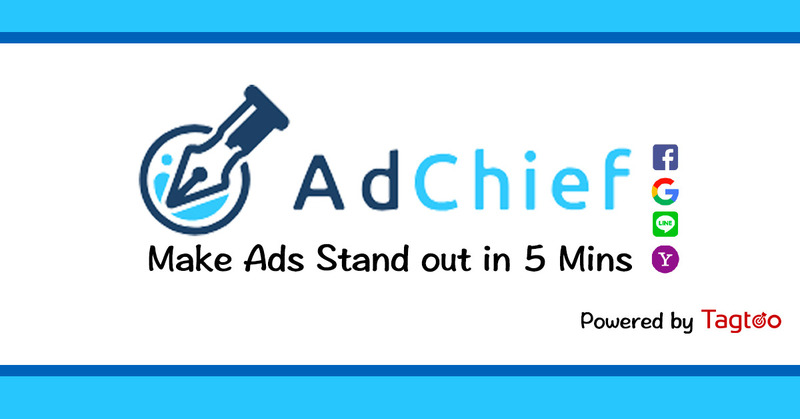 On AdChief, we provide a friendly environment that allows advertisers to edit products pictures crawled by our tracking code and add on any relevant information to produce an amazing banner in just 5 minutes. Just like any other editing software and the only limit is your imagination! Afterward, you can apply the changes, or so-called templates, to hundreds of thousands of product feeds in real time, making carrying out A/B test much easier and the banners look more professional. The final step after editing is to start delivering your ads to the audience. Undoubtedly, you can do that on AdChief as well without logging to any advertising platform again. Connected to Google Adwords and Facebook Ads, AdChief enables you to display ads with beautiful creatives in major platforms by simply completing the basic setting, such as the budget and target devices. Of course, you can further narrow down your target audience by going to details setting. With that said, starting delivering ads is also another beginning. A good ad campaign requires constant monitoring and optimization. But don’t worry at all. Tagtoo Engine, our self-built database that consists of past 8 years ad delivery data, and our account managers will provide real-time support to help optimize to the best result. According to our very recent finding, UV100, a sun protective clothing e-commerce, saw the dramatic changes in online sales. Within only two weeks, the performance of transaction count grew by 380% and conversion rate rose by 60% on average on Facebook Ad campaigns. Discover how Dynamic Product Ads and AdChief will help you sell more! AdChief simplifies banner design into a hassle-free approach and helps apply the well-crafted template to hundreds of thousands of products. This one-stop solution is especially helpful for e-commerce that lacks organized design teams. Fill out the forms below to sign up for AdChief Beta. Be the early bird to experience what the real e-commerce solution is and you can transform your online sales to the next level. Only 100 accounts opens for the public. Sing up Now!